​Choosing the right sails can be a daunting experience for any sailor. Whether you’re new to cruising or you’ve been knocking around local waters for years, the lure of open water and longer passages can get to you. When it does, it’s important to have the right sail inventory. This series, How to Choose Your Cruising Sail Inventory, Quantum's Dave Flynn will help guide you through the process and make sure you know what questions to ask. What makes a good batten? Battens are like the framework of a tent – they keep the material taut and smooth. Without battens, the roach would flap uncontrollably. Acting as I-beams, they resist the forces on the sail that try to compress the leech in towards the luff when the sail is sheeted in. This preserves the open-leeched airfoil shape and keeps the sail from becoming fuller and more semicircular as the breeze increases. Battens also provide much-needed structure and support that help maintain your sail’s shape and durability. The more roach you need to support, the more important battens become. Full-length battens carry the compression loads all the way to the mast. The more full-length battens you use, the more durable your sail will be, and the better it will hold its shape in a breeze. Also, the more structure you give to your sail, the less it will flog. Battens need to be stiff enough to resist compression loads. Solid, pultruded glass battens are cheap, tough, and virtually indestructible, but they usually lack necessary stiffness. They also aren’t tapered. Tapered battens provide an advantage because they mimic the sail shape when compressed and do a better job of maintaining airfoil shape. There are various flat, foam-cored, laminated tapered battens that work well on smaller boats (under 40 feet). They aren’t as rugged as solid glass, but are usually lighter. On larger boats, round battens work best because the round shape provides stiffness without increasing size. Plus, they’re very hard to break (for boats over 60 feet, consider carbon battens). No matter which battens you use, carry a spare on board (equal in length to the longest batten). The downside to full-length battens is the compression they transfer to the luff hardware. Battens force the luff into the back of the mast. That loads the sail slides, creating friction and causing them to twist and toggle in the groove. In worst case scenarios, slides can lock up and prevent the sail from being raised and lowered. At a minimum, batten compression causes chafe and wear at the inboard end where the batten presses against the mast. Another possible problem with full-length battens is that they tend to poke past the mast, creating a V-shaped wrinkle. That wrinkle at the inboard end of the batten keeps the sail from having a smooth, clean shape. 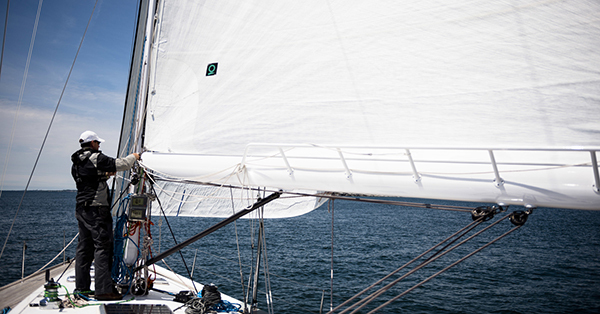 To avoid these problems you can use shorter battens, but those can create another problem – the compression loads are transferred to the sail cloth instead of the mast. Over time, that can break down the fabric and create hinging. Each of these problems is magnified as the sail gets bigger. Though battens can cause additional wear to your slides or sail fabric, their benefits tend to outweigh their problems. When you look at your mainsail options, you have three basic choices: conventional (non-furling), in-mast furling, and in-boom furling. For conventional mainsails, full-length battens have become standard issue in the top sections of the sail. It’s up to you whether or not you want to use battens throughout the rest of the sail and how long you want those battens to be. If you have an in-mast furling system battens are not an option. Removing them can have a negative impact on the shape and size of the sail, as well as performance. Vertical battens can be used, but they tend to add to maintenance and might compromise functionality for a relatively small gain in area and leech support. In-boom furling systems allow the best of both worlds. They do require more attention – particularly when protecting the luff tape while furling – but they also provide uncompromised size and structure with the convenience of roller furling. Regardless of whether or not you choose convention sails or a furling system, full-length or shorter battens, make sure you understand your options so you can make the best decision for your boat. Part 4: Will You be Ready Offshore When Rough Weather Hits?